Some seaports in the Southeastern U.S. have established intermodal "dry ports" hundreds of miles from the ocean. Why do they build them, and why are a growing number of importers and exporters using them? For most people, the term "seaport" evokes images of salt air, waves lapping at the hulls of ships, and busy docks piled high with containers. But in Southeastern states like North and South Carolina, Georgia, and Virginia, it could also bring to mind rolling hills, railroad tracks, and bustling intermodal yards. That's because port authorities in those states have established "dry ports," located hundreds of miles from the ocean, to handle some of the containers transiting their harbors. Arrangements vary depending on the parties and locations involved. Usually, though, port authorities will arrange rail transportation between their marine terminals on the coast and the inland ports they own. Importers and exporters typically pay their ocean carrier an all-inclusive rate that includes inland transport. The first of these seaport-owned facilities, established in the 1980s, were slow to gain traction. But the concept proved prescient, and today, seaport-owned inland ports, especially those in the Southeast, are thriving. Container volumes are steadily increasing, and shippers like BMW, Procter & Gamble, and The Home Depot are taking full advantage of their services. The model has been so successful, in fact, that several new inland ports have opened in the past five years, and at least one more is on the drawing board. Why are inland intermodal ports in the U.S. Southeast gaining in popularity now? What benefits—and potential drawbacks—do they offer for importers and exporters? Here's a quick overview. They need to be competitive. Shippers can choose from any number of seaports as gateways for moving their containers, so ports have to compete for their business. By operating an intermodal facility at an inland location, port authorities say, they can help shippers use rail to bypass road congestion in urban seaport districts; shorten the distance between the plant or DC and the container pickup/dropoff location; and access scheduled, predictable service with large-scale capacity. All of this reduces shippers' transportation costs and uncertainty, which in turn enables port authorities to attract new business and capture additional volume from existing customers. They need to protect their geographic market share. In the crowded East Coast market, seaports' hinterlands overlap. Depending on their product and location, importers and exporters in the Midwest could ship through multiple seaports at comparable costs. "Bringing the port to the customer" helps seaports compete for hinterland traffic, according to New Harbor Consultants' 2016 report Inland Ports: On Track for Growth." They need to reduce congestion and environmental impact. Road congestion, which clogs streets and increases air pollution, is a problem around many U.S. seaports. Moving inbound and outbound freight by rail reduces both impacts. That's the thinking behind the Georgia Ports Authority's new Chatsworth facility, which will reduce the need for northwest Georgia shippers to route exports bound for Savannah, located in the state's southeast corner, through metro Atlanta by truck. For an inland port to be successful, the economic value proposition must be strong for all parties: the seaport that owns and operates it, the railroad that connects the inland and marine terminals, and the importers and exporters that move their containers through the inland port. "Everybody should be able to jointly see a true growth opportunity," Kemmsies says. But shippers may be the linchpin. Commitments from large importers or exporters with consistent container volumes—what he calls "anchor tenants"—are critical to ensure that the facility has the minimum number of "lifts" needed to cover the railroad's operating costs, he says. There are several reasons why importers and exporters might want to make those big commitments. Being able to pick up and deliver containers to a facility that may be just a few miles or minutes away, rather than travel 200-plus miles and several hours to a seaport, produces cost and time savings that are hard to overlook. There's also less traffic congestion out in the country, and some intermodal facilities receive and allow pickup of containers 24 hours a day, offering more flexibility than marine terminals typically do. The potential savings are so attractive that it's not unusual for shippers to locate DCs close to inland ports, as The Home Depot, Kohl's, Rite Aid, and Red Bull have done near the Virginia Port Authority's inland port in Front Royal. One example of a shipper that saw the potential benefits of an inland port and made them a reality is the automaker BMW. The South Carolina Ports Authority (SCPA) owned some land adjacent to a Norfolk Southern rail line in the town of Greer, 212 miles inland from the Port of Charleston. Nearby, BMW has a giant auto-assembly plant that was moving hundreds of import and export containers each day by truck. SCPA had long considered developing the parcel for intermodal use, but BMW, recognizing that reliable intermodal service could significantly reduce its costs and improve transportation efficiency, "pushed us to move forward," says Micah Mallace, director regional sales, South Carolina Ports. Because Inland Port Greer is open 24 hours a day, seven days a week, the intermodal terminal can quickly process the 200-plus import containers that arrive every night via the Norfolk Southern, ensuring uninterrupted availability of parts at BMW's plant. Since Inland Port Greer opened in 2013, the railroad has moved over 180,000 containers for BMW, delivering them on a just-in-time basis to the assembly plant, which is served via a rail spur—no local trucking required. While inland ports offer a number of advantages, importers and exporters should carefully weigh both the benefits and potential drawbacks before they make a commitment. First and foremost, perhaps, is to make sure the intermodal service on offer is regular, reliable, and cost-effective. Indeed, as the New Harbor Consultants report noted, shippers will use an inland intermodal port "if transit times, reliability, and cost are attractive compared to truck." In many cases, they are, and the inland ports consider that favorable comparison to be one of their major selling points. Another consideration, JLL's Kemmsies says, is whether there may be service constraints. "A lot of inland ports will be served by only one railroad. Will you be getting away from expensive trucks and labor, only to fall into a situation where a lack of diversification is not in your favor?" he asks. Kemmsies advocates retaining the ability to reroute cargo "to maintain competitive strength as well as to improve reliability." For shippers that are considering locating a DC close to an inland intermodal port, the availability of reasonably priced land with easy access to multimodal freight capacity is critical, Kemmsies says. But the biggest cost consideration right now is labor. "You want to know who else is located nearby. If the area you're looking at is not urban, four other DCs are there, and there's a limited labor pool, there will be lots of competition for labor." That can raise labor expenses, reducing or possibly eliminating the area's cost advantages. And finally, trust but verify. Some inland ports do not function as advertised, according to Mallace. "When congestion, inflexible operations, limited working hours, unpredictable rail scheduling, or other such challenges become the norm at an inland port, the advantages quickly disappear," he cautions. "A correctly run inland port should reduce cost [for shippers] while at the same time improving the consistent flow of a supply chain." Like their marine terminals, seaport-owned inland ports have seen steady growth in container volumes in recent years. The Virginia Inland Port at Front Royal, for example, set a new monthly record for container volume (including empties) in October 2018, handling 3,958 boxes, up nearly 18 percent over the same period in 2017. Front Royal may have been a victim of its own success; it recently received a $15.5 million federal grant to improve rail, road, and bridge infrastructure to ease traffic congestion. Demand has been high enough, in fact, that several port authorities have built or will build additional inland terminals. Virginia, for example, added an inland port in Danville, near the West Virginia border. A new Procter & Gamble manufacturing plant nearby will soon join a customer roster that includes Rubbermaid, The Home Depot, and Family Dollar. 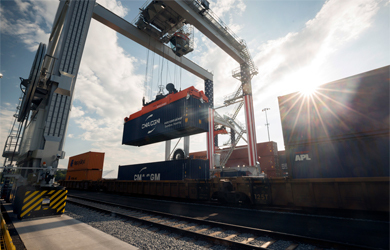 South Carolina Ports opened a second intermodal facility, Inland Port Dillon, served by CSX, in April 2018. In North Carolina, the state port authority relaunched service via CSX from the Port of Wilmington to its Charlotte Inland Terminal. It also operates the Piedmont Triad Inland Terminal in Greensboro. And the Georgia Ports Authority (GPA), which started in 2013 with an inland port at Cordele, in the southern part of the state, opened the Appalachian Regional Port near Chatsworth, nearly 400 miles from the Port of Savannah, in August 2018. Among its biggest users are the Volkswagen plant in Chattanooga, Tenn.; car parts manufacturers; and carpet and flooring producers in northwest Georgia and eastern Tennessee. And there's more: In December 2018, GPA announced plans for the Northeast Georgia Inland Port near Gainesville, to open in 2021. The number of inland ports will grow in the near future, Kemmsies predicts. Not only are they effective options for avoiding congested seaport environs, but they also can help to counter the effects of the truck shortage. "We need an alternative to tapped-out truck capacity. With electronic logging devices, it's becoming a lot harder to get truck capacity, and the hours-of-service restrictions on top of severely congested roadways are affecting how far truckers can go and come back on the same day," he says. Pair that with record-high import container volumes and increasingly big ships, and it looks like the need for inland intermodal ports will only grow. Feedback: What did you think of this article? We'd like to hear from you. DC VELOCITY is committed to accuracy and clarity in the delivery of important and useful logistics and supply chain news and information. If you find anything in DC VELOCITY you feel is inaccurate or warrants further explanation, please ?Subject=Feedback - : Southeastern seaports head for the hills">contact Chief Editor David Maloney. All comments are eligible for publication in the letters section of DC VELOCITY magazine. Please include you name and the name of the company or organization your work for.